June Stitch of the Month Group | NJNA is Blogging! The NJNA SOTM group met on Saturday to continue with “A Different View” by Kurdy Biggs. In June we are working on completing our first octagon in the design. 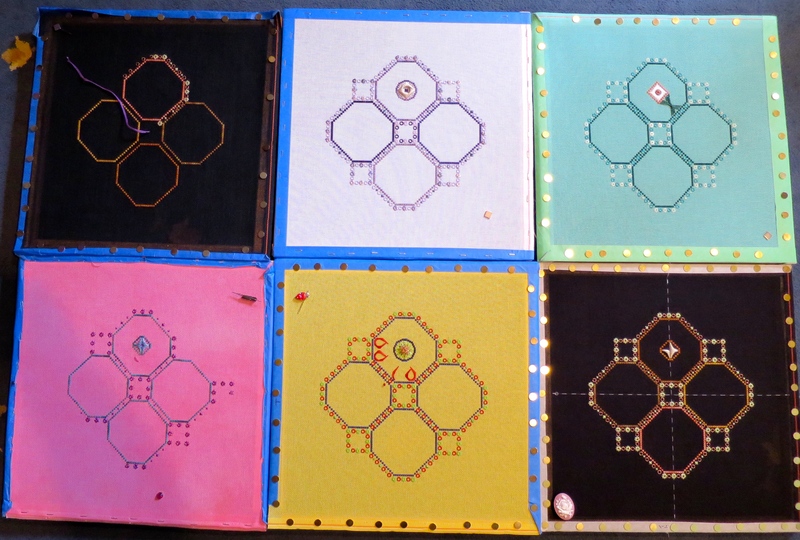 The pattern comes with six options for four octagons, so we were not all working on the same stitches this month. Between different threads and unique stitches — we were awfully glad that we were doing this in a group! 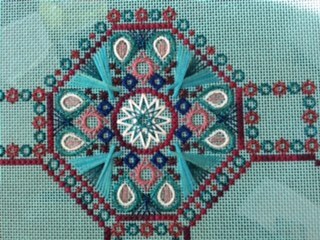 Linda wasn’t able to join us this month, so she sent us a photo of her finished octagon — isn’t it beautiful? All of the different colorways and choices are making this a fun project! Stay tuned for more close-ups as the various octagons are completed! Since the NJ Needlefest in November will occur on our regular SOTM date, we have decided to reserve a table for our whole group! We’ll be adding the finishing touches of beads then!